The browser game Kapi Hospital - play now! Become chief physician and attend to your patients! 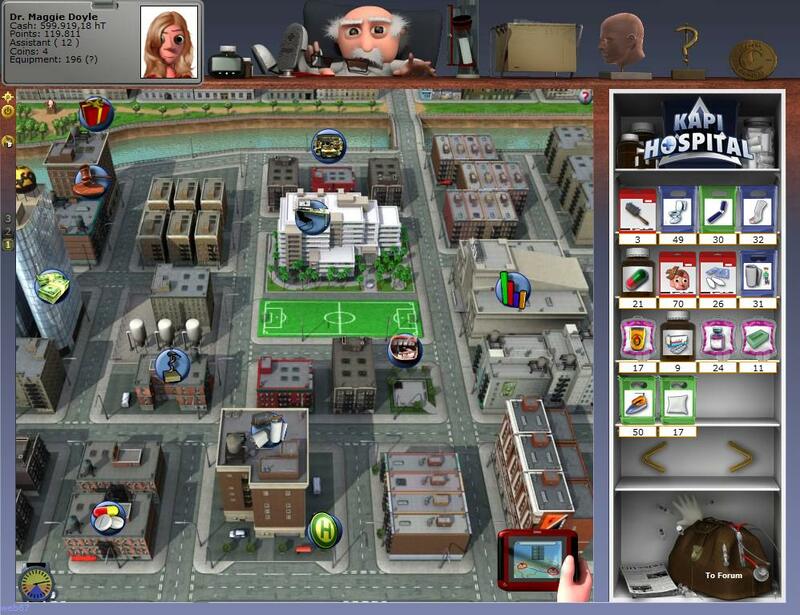 The browser based online game Kapi Hospital! Your very own hospital. Patients with strange diseases, and alternative medicine you've never seen before: the first economic simulation situated in a hospital! Click and register! Please check the game description about possible risks and side effects, or ask your physician or pharmacist for screenshots. "Kapi Hospital" - from: The Great Medical Encyclopedia. A specialist guidebook for medical emergencies in all walks of life. Kapi Hospital is a free browser game, playable any time (just as all other free online games from upjers) in your browser, without any downloads. 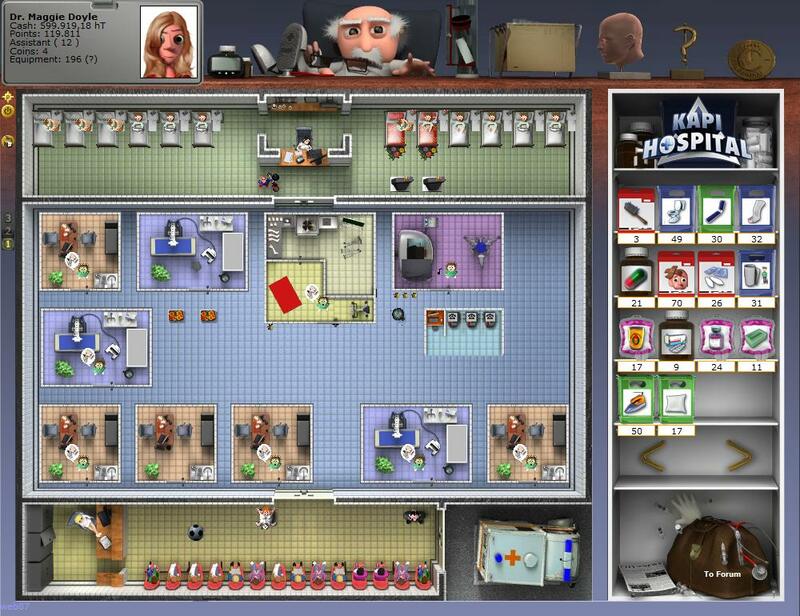 A cursory glance shows this browser-game to be distinguished by a carefully crafted hospital-setting with simulations of wheezing patients, numerous different sickrooms, and several towns with a wide range of features. On delving deeper into this extraordinary phenomenon called Kapi Hospital, a few further noteworthy features will come to light, such as: the treatment of unusual diseases, as well as the provision and administration of alternative pharmaceuticals. Apart from this, evolutionary research is just waiting to be conducted and ambulances will have to be dispatched on non-stop-questing-duty. 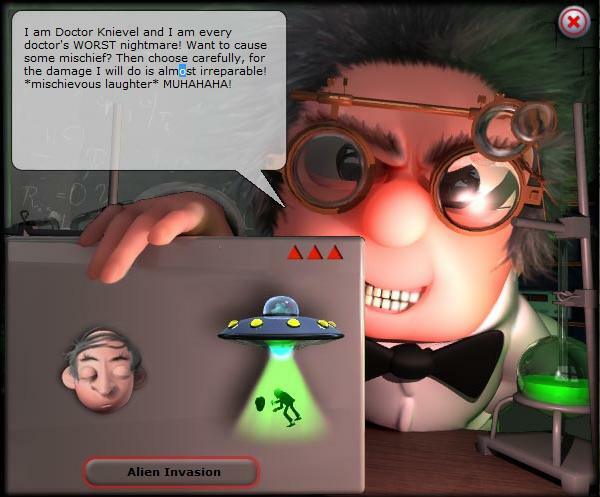 Aliens on patients-abducting-sprees, cleaning squads obsessed with tidying, aliens abducting patients, and brawny builders help to additionally cause acute game frenzy. 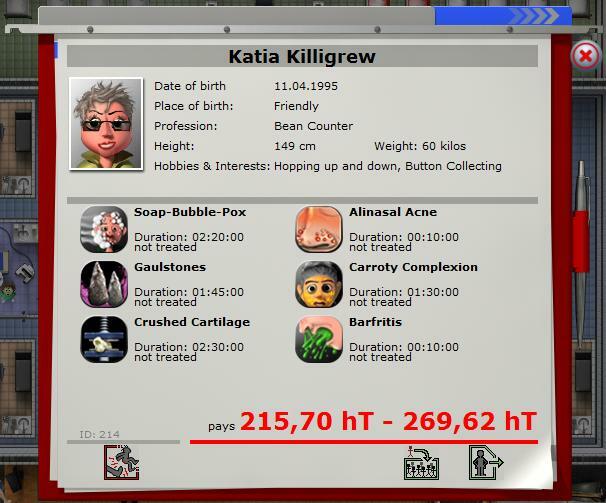 The so-called "gaming fun" is a well-documented and frequent side-effect of Kapi Hospital, caused directly by the catchy game-design of this economy simulation. 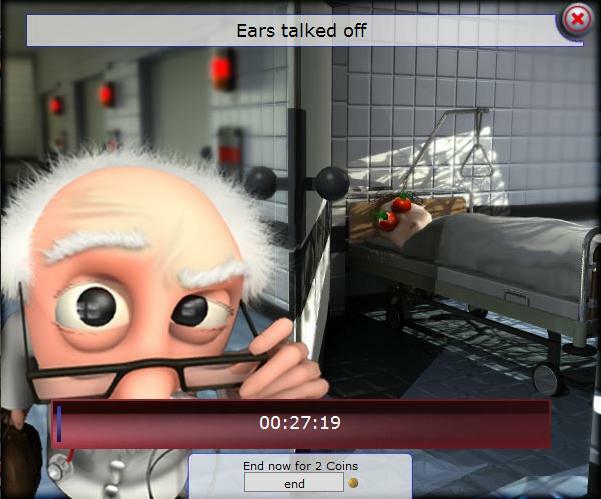 Those possessed by acute gaming frenzy also tend to refer to the high-quality graphics that together with meticulous attention to details make this hospital game one of a kind. Create your very own hospital in the free browser based online game Kapi Hospital and become the greatest Medical Director of all times! You consider hospital games and economic simulations to be much too dry and no fun at all? 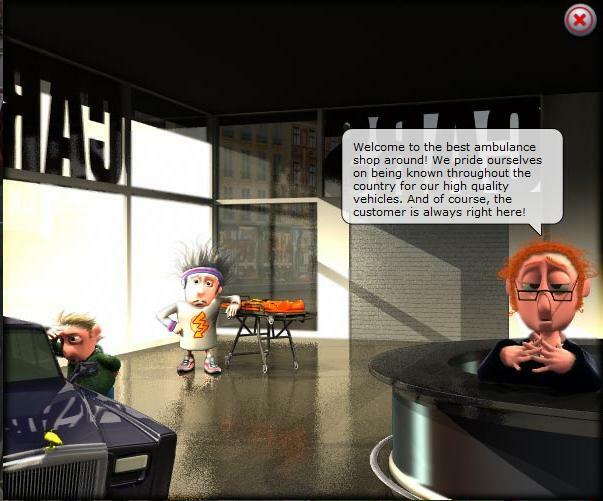 Well, then give this free online game a try, and you will discover an exciting, entertaining and funny simulation that is simply one of a kind: Funny, witty, colorful and a great deal of fun - join the fantastic community and see for yourself! The story behind this browser game! Hi there, you must be Professor Fluffling's new student! Impressive to see what a great and experienced teacher you've got, I must say! But good contacts are the best stepping stones on the way to the top, I am told. The initiation into the halls of health has taken its toll on you already, I can see. No worries, this happens to all newbies. Generally they run off screaming when they first set foot in their very own hospital.Ah, the young ones, what can I say? A bunch of wimps, the lot of them. Well, I had my medical break-through when cross-breading monkeys and apples. Windfall was a thing of the past as a result, but the neighbors started to complain about the shrieking in the tree-tops. Besides, I made an enemy of Dr. Knievel, and that was pretty much the end of my career... but that's a long and sad story... You might want to ask Aunt Emma if you are interested in hearing the whole tale, I am getting all sentimental just thinking of it. To cut a long story short: Dr. Knievel started spreading rumors, and as you know word gets around pretty fast in a hospital (there are only so many floors, after all...). Anyway, Dr. Knievel's tales made me lose my scholarship, and my career went down the drains. And I'd only just managed to breed a waterproof silverfish. Tragic, tragic. From high-flying genius to luckless sod in a matter of moments. *sigh*. But I'm sure you'll do better, much better. Follow in my footsteps and become head of department at Kapi Hospital..
Prof. Dr. Dr. Fluffling MD is expecting you and I have put in a good word at the doctor's association - so your way to fame is practically paved. Well then, show me what you're made of - and in case you decide to continue my silverfish-research: The key to success is genetically modified beeswax. Mark my words! But don't dally now, start your new life on Kapi Hospital! Patients suffering from bullfrog burbs or barfritis will turn to you here - because you are the only one who knows the perfect remedy for every ailment! 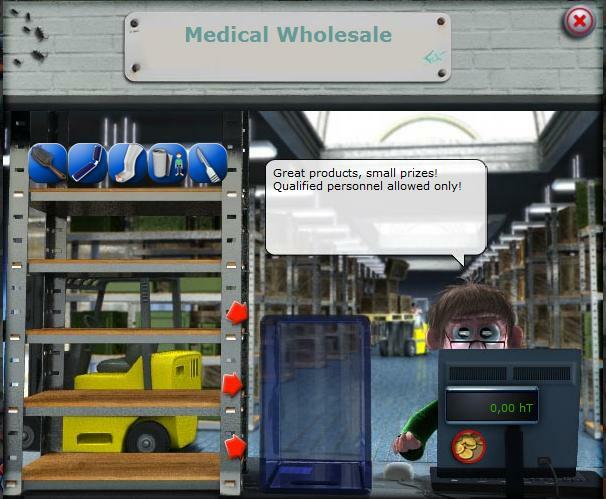 Humorous and bustling with funny characters, this free browser game makes you head of your very own clinic. Of course you're not on your own there: a caring nurse will take your patients' temperature and change their bandages, a busy cleaning lady will uphold your hospital's hygienic standards with an iron... erm... mop, while nurse Olga keeps track of all incoming and outgoing patients. Clear your clinic of all useless lumber and build X-ray and EEG rooms! Brawny builders will take care of all construction works and Professor Fluffling - the wise mentor of this online game - will always come to your aid and offer his advice. Work hand in hand with others! Kapi Hospital is haunted by mischievous Dr. Knievel who sends out alien armadas to abduct patients! Stick together and found doctors' associations to coordinate your actions and collect donations for various in-game-contests: This browser-game is all about the community. The beauty is in the details: Bustling animations make your online hospital come to life, and you'll turn from hospital-management-newbie to a veritable expert in treating weird diseases and mad patients in no time. There is so much to discover - join up and play Kapi Hospital without any downloads, directly in your browser! More than 6 million active players! Internet Explorer login problems? Delete Cookies here! Centralized login with your portal-account.